A report released by Blue Shield of California Foundation describes findings from a California statewide survey conducted in July 2015. 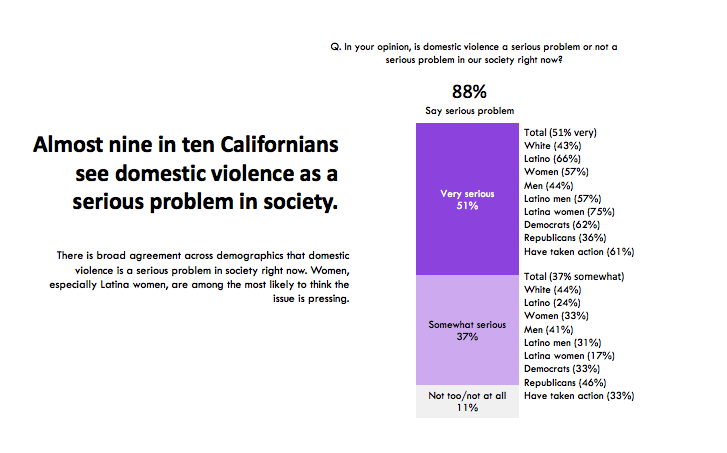 The survey was administered to adult Californians to better understand their views on sexism, inequality and domestic violence. 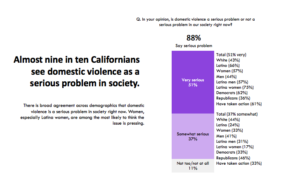 The survey also looked at Californians’ views of prevention – or more specifically – explored actions that Californians are willing to take to stop domestic violence. While most survey respondents said they will act to stop domestic violence when the person is known to them, many of them also said that in general they would not intervene in a domestic violence situation due to a lack of knowledge about what to do and concerns about their personal safety. These are both real concerns that prevention practitioners encounter often. What is promising and an opportunity for those working to end sexual and domestic violence, is that while those surveyed may not know what to do or be hesitant out of fear, they also are not content in not doing anything. Further, almost two-thirds responded that they are willing to take political action to end domestic violence. This report suggests that people are aware that domestic violence is a serious problem and that they are ready and willing to act to stop it. They are asking for skills, tools, and options. Now is the time for prevention.